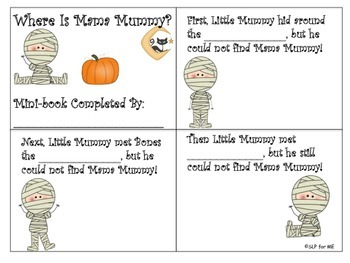 *** The first activity is a mini-book to be paired with the book Where’s My Mummy? By Carolyn Crimi. It is necessary for this activity to have the book to complete the mini-book. 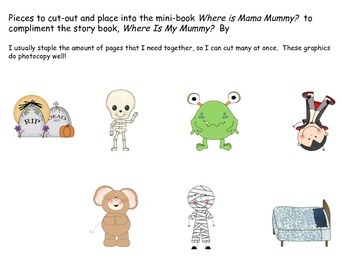 The mini-book was designed to help students relay a sequence of events and recall the main characters to place in order to complete the book. 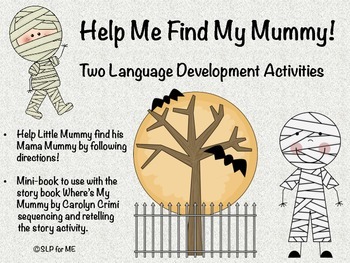 The second activity – Help Me Find My Mummy – Targets the skill of following directions containing linguistic concepts. 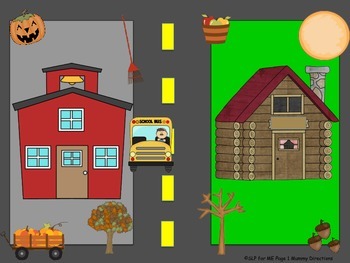 You could additionally address listening skills that the students would be required to request the items after hearing parts of a story, written by me in this case, repeating what the characters say and then completing the directive stated. Directives contain the prepositions, on top, in between, over, next to, etc. If you have any questions or comments regarding these activities, please contact me at chattywex@hotmail.com or message me on my Facebook page SLP for ME. ******** To conserve printer ink, I made extra slides depending if you would like to use the darker road or not of the second activity. Please review all slides before printing. Thank you!